Life presents us with a steady stream of decisions that we have to make. So, like it or not, we need to practice this skill every day – at work, at home, and in every aspect of our lives. Yet, we often make decisions without properly considering the context, options and implications of our actions. Or worse still, we end up managing the consequences of avoiding taking difficult decisions. Decide sets out a clear and easy to follow model that will enable you to make or contribute to effective decisions, proving that it does not have to be a long drawn out process, as long as you use a mixture of rational and lateral thinking. Free from business jargon, and filled with relevant case studies, Decide is a vital book for everyone whose life revolves around successful decision making. Thought-provoking and practical, it will help you always make the right decisions, and choose from your options wisely, whether you have 60 days, 60 minutes or just 60 seconds. To buy your copy of Decide visit Amazon by clicking here. “Reading “Decide” last night with half an eye on the evening news, I suddenly became aware of how many items of national interest involved decisions. “I’m not ordinarily a great fan of business/self-aid book. This book has changed a good amount. It’s changed how i look at these books and it has also changed how i make decisions. 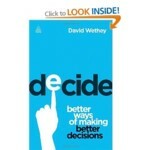 “David Wethey says early on in his book when he quotes Napoleon ‘nothing is more difficult and so more precious than being able to decide’ One decision is easy though, having read this book, you should definately decide to read it. Part manual, part philosophical text: a compelling read. If you think you don’t need this book, you are probably just the kind of decision-maker who does. Just decide. “If this book doesn’t convince you that you are not quite the decision-making wizard you thought you were, then beware, you might be deluding yourself. The author has not set out to discover a silver bullet, or to create a classroom list of dos and donts that will transform your performance, but to lead the reader into and through the briar bush of decision-making with a virtuoso review of received wisdom and unique anecdotal insight. Personal history, the experiences of leading figures and a review of past authors’ offerings on the subject combine to make a very readable and enjoyable voyage through a subject that simply refuses to be reducible to formulae.